So, to celebrate Dharmendra’s 79th birthday, a list of ten of my favourite songs of his, from pre-70s films that I’ve seen. To make this challenge a little tougher for myself, I’m restricting the songs to solos in which Dharmendra’s character does the singing. No duets. 1. Tum pukaar lo (Khamoshi, 1969): I first watched Khamoshi as a pre-teen, and for many years later, retained the impression that Dharmendra played the main male character—in my mind, his role was far larger than that of Rajesh Khanna. Which says a lot for Dharmendra’s presence; when I rewatched the film a few years back, I was surprised to discover that he actually has a guest appearance, and is never shown full face. But one of my favourite songs ever, in any voice, any film, any era—was picturised on Dharmendra in Khamoshi. Tum pukaar lo, a hauntingly beautiful song about waiting for one’s love. And though one can only see Dharmendra from the back, his body language reflects the song: the restlessness, the loneliness, the waiting, the pacing about, the moments of reassuring oneself, of reminding oneself that the beloved will come. Unforgettable. 2. 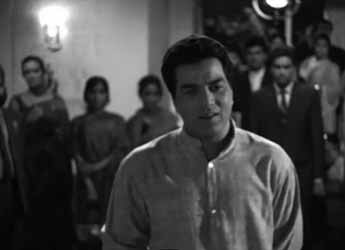 Ya dil ki suno duniyaawaalon (Anupama, 1966): A lot of Dharmendra’s films during the 1960s were women-oriented films. Khamoshi was one such; so was Anupama. This was also one of the films (the other was Satyakam) about which Dharmendra was to say in later years that when he didn’t receive a Filmfare Award after having put in so much effort, he gave up trying to act altogether. And his acting in Anupama was good. Here, as the young poet called upon to sing at a party, he chooses to use his voice to speak up for the repressed and timid girl he’s fallen in love with. Like Tum pukaar lo, Ya dil ki suno duniyawaalon was also both scored and sung by Hemant. A quiet, poignant little song of unhappiness and neglect. 3. 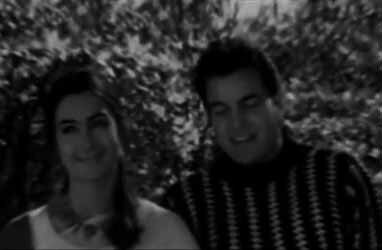 Hui shaam unka khayaal aa gaya (Mere Humdum Mere Dost, 1968): Beginning in the mid-60s and right through till well into the 70s, Dharmendra and Sharmila Tagore (who, incidentally, also has her birthday today) worked together in a bunch of films, some brilliant (Anupama, Satyakam, Chupke-Chupke), some average. Mere Humdum Mere Dost was among the average ones as far as storyline went, but it had one redeeming feature: some really nice songs. I was torn between the title song and this one—but Hui shaam unka khayaal aa gaya won. One of those quintessential daaru songs, the betrayed lover wondering why the woman he loves deceived him—but unable to forget her. 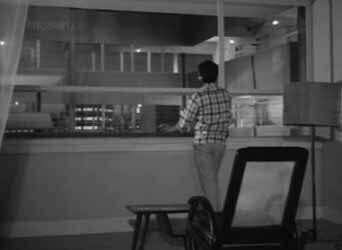 Dharmendra wanders about an empty house, bemoaning his lost love as he drinks. He doesn’t do maudlin too well (who does, actually? ), but he looks good anyway—and I like the music and Rafi’s singing. 4. Mujhe dard-e-dil ka pata na thha (Akashdeep, 1965): Those who know Dharmendra as the brawny, “Kutte, main tera khoon pi jaaoonga!”-spouting he-man of the 70s would have a hard time recognizing him as the romantic hero of so many of his early films. In this song, he’s a very far cry from the Dharmendra of the 70s: a dreamy-eyed man singing a song of love for the woman he adores. A softly romantic song, where he marvels at how fate has brought them together, and how a man as unexceptional as he should have been fortunate to win her hand. What a simply beautiful song, and how gorgeous Dharmendra looks. Plus, his emoting is actually pretty good: there’s a sort of wistfulness at times, as well as a sense of wonderment at this new-found love. 5. Aapke haseen rukh pe (Bahaarein Phir Bhi Aayengi, 1966): Another wonderfully romantic song, and with everything necessary to make it a classic: a handsome man, two beautiful women (sisters, and both in love with him), a piano, and a quiet evening at the sisters’ home. Our hero is invited to sing a song for the ladies, and chooses to make it a romantic one—aimed, of course, at the younger sister (played by Tanuja), whom he loves (and who returns that love). Neither of them realize that the older sister (Mala Sinha) thinks the song is being sung for her. As I was creating this list, I realized just how many of the most romantic songs of the 60s are picturised on Dharmendra (and I’m not even counting what I consider the most romantic song of the 70s, Pal-pal dil ke paas tum rehti ho): looking at his later avatar, who’d have imagined this was how he started out? I’m not complaining, of course. 6. Ek haseen shaam ko (Dulhan Ek Raat Ki, 1967): Another love song in the evening, this time out in the open. In a film which was otherwise rather grim and depressing (it was, after all, based on Tess of the D’Urbervilles, not the most amusing of novels), Ek haseen shaam ko was one bright spot: a melodious, beautiful song about falling in love. 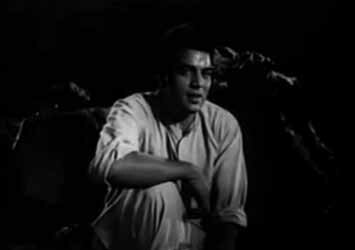 And the picturisation of the song is as beautiful as the song itself: a handsome Dharmendra, a delicately lovely and shy Nutan wandering through pine woods, bamboo groves, and under a grove of flowering trees. Exquisite. And Dharmendra has that softly loving look in his eyes as he smiles at Nutan… he could act well. 7. Mere dushman tu meri dosti ko tarse (Aaye Din Bahaar Ke, 1966): When all that romance sours (thanks to horrible misunderstandings and a reprehensible desire to sacrifice one’s love for one’s friend)… there’s this. A washing of dirty linen in public. As Anu mentioned in her post, why are these songs of bitterness, deriding the treacherous ex for his/her betrayal, invariably sung in public? It’s the same here, and the curses showered on the supposed betrayer are poetic but cruel. The good thing is the music, which is lovely; Rafi’s rendition, impeccable; and Dharmendra—as ever, handsome (he, incidentally, is one of the few actors I’ve come across who manages to look as good in a crumpled kurta-pyjama as he does in a suit). 8. Mujhko is raat ki tanhaayi mein (Dil Bhi Tera Hum Bhi Tere, 1960): Dharmendra’s very first film wasn’t a great one, and he was a little gawkish, awkward (in my opinion, Dharmendra is one of those actors who didn’t start off looking great—though he was never bad-looking—but developed into utterly droolworthy some years into his career). Dil Bhi Tera Hum Bhi Tera didn’t even have very noteworthy songs—except for this one, which appears in two versions, one sung by Lata for Kumkum, and this one, sung by Mukesh for Dharmendra. Mukesh isn’t a name I tend to associate with singing playback for Dharmendra, but the bleakness of this song somehow makes the combination work. This is a man whose sweetheart is suddenly dead, supposedly drowned at sea: life stretches ahead of him, lonely and sad… and though he begs her memories to not torment him, can he really live without even them for company? 9. Dekha hai teri aankhon mein (Pyaar Hi Pyaar, 1969): Pyaar Hi Pyaar was one of the last films Vyjyantimala worked in: she was due to get married and was putting her career behind her; the result was that she was not particularly interested in working in this film. As Dharmendra mentioned in an interview later, she didn’t even speak to him—other than her dialogues, of course—during the making of the film. (I’ve heard elsewhere that they weren’t introduced to each other). Despite that, Dharmendra and Vyjyantimala had three good songs picturised on them in this film. One (Tu mera main teri duniya jale toh jale) was a duet; two were Dharmendra solos—Main kahin kavi na ban jaaoon, and this one. 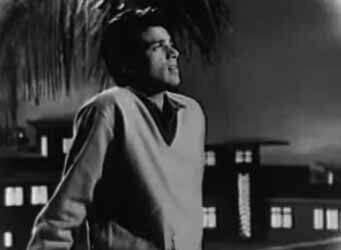 I like Dekha hai teri aankhon mein because the picturisation is fun (plus the landscape is true-blue 1950s and 60s picnic spot), what with Dharmendra being all lovey-dovey and Vyjyantimala (who’s got him convinced she reciprocates his feelings for her) making faces on the side. 10. 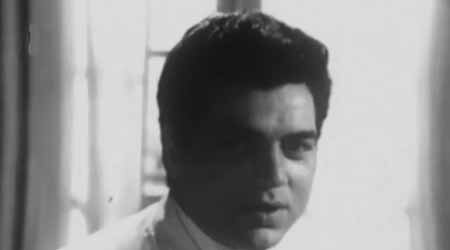 Gar tum bhula na doge (Yakeen, 1969): The same year that he starred with Vyjyantimala in Pyaar Hi Pyaar, Dharmendra appeared in Yakeen with an old and familiar co-star: Sharmila Tagore, with whom he’d already worked in Devar, Anupama, and Mere Humdum Mere Dost (and with whom he would go on to make other films too, including the brilliant Chupke-Chupke). The level of comfort between the two of them shows in this song, a romantic one with a touch of the sensual in its picturisation—even up to the drenching in the rain (which, as we all know, has fairly predictable consequences). Rafi, as Dharmendra’s most usual voice, is perfect. As is Dharmendra. Which are your favourite Dharmendra solos? Pedantic correction: hometown’s name is Sahnewal. Oh, thank you, Bawa. I hadn’t known that. Will correct it. You have included some of my most favourite songs. But one I would definitively like to include in Dharmendra’s best is Aap Ki Parchhaiyan‘s ‘Main nigaahein tere chehre se hataaun kaise’. That’s a lovely song, AK. I haven’t seen Aapki Parchhaaiyaan, but the one song of it that I am always reminded of is Yehi hai tamanna, a good song but also a hilarious example of just what an awkward dancer Dharmendra was! LOL! Now I should stop being surprised at stuff like that. You and I share far too much in common (down to people we know!). Must go off and have a look at your post once I’ve finished responding to the comments here. It’s kinda sweet, though, that Sharmila Tagore and Dharmendra – who acted in so many films together – should share a birthday. I wonder if they ever got to celebrate in a joint party during a shoot. In an interview on his birthday (this year), Dharmendra fondly remembered how they jointly cut a cake on the sets everytime their birthdays coincided with a shoot. :-) Glad you liked the songs! I like Bahaaron ne mera chaman lootkar more than Aaye hai mujhe phir yaad, but yes, they’re both beautiful songs. Dharmendra has lip synched so many good song! The only song I am not very fond of from your list is Dekha hai teri aankhon me. I do know why I have aversion to that song. Mere Humdum Mere Dost had three good songs and I would choose Chhalkaye jaam over title song. I like the bitterness of Mere dushamn tu meri, Dhamendra had another very good bitter song in Izzat, with Sahir’s lyrics, who was the master of bitterness. The other song I would like to add is on the fence of 70s, if from Ishq par zor nahin, surprisingly Dharmendra acted both in Shola and Shabnam and its remake Ishq par zor nahin. I hadn’t known Ishq par Zor Nahin (which I haven’t watched) was a remake of Shola aur Shabnam. I must admit I didn’t like Shola aur Shabnam much, so that doesn’t really make me want to watch Ishq par Zor Nahin…but Mehbooba teri tasveer kis tarah is a nice song. From Izzat, I had checked out Kya miliye aise logon se, but dropped it – the song I really love from that film, Yeh dil tum bin kahin lagta nahin – is a duet. And that, of course, isn’t part of this list. Aaj mausam bada beimaan hai is a favourite of mine, too. However, since Loafer is from well into the 70s, I couldn’t include it. Yes, Mere Humdum Mere Dost had a lot of good songs, didn’t it? Chhalkaaye jaam aaiye aapke naam was also on my longlist, even though I eventually gave it up for Hui shaam unka khayaal aa gaya. From your list, Ya dil ki suno, Aap ke haseen rukh, Tum pukar lo, Ek haseen shaam ko, and Hui shaam unka khayaal aa gaya are particular favourites. I notice that Sucheta added one of my other favourites – Jaane kya doondhti rehti hai. Another one of the ‘washing dirty linen in public’ songs, though here he is excoriating the man who betrayed him. I like both Chhalkaaye jaam and Bahaaron ne mera chaman lootkar – thank you, Anu! And glad you liked the songs I’ve posted. And happy to know the wedding is done – so, hopefully, once you’ve recovered, we should hope to see a post up on your blog? Have been having withdrawal symptoms. Pal Pal Dil Ke Pass from ‘Blackmail’ and Aaj Mausam Bada from ‘Loafer’ are on my list! From the 70s, those are my two favourite Dharmendra songs. Pal pal dil k paas more than Aaj mausam bada beimaan hai, though. What a simply gorgeous song. It’s interesting, but I must have been one of the few people born in the 70s who actually discovered Dharmendra (and most of his contemporaries) first in their 60s films – because I watched almost no films till I was about 9 and we finally got a TV! Till then, my father was posted in really tiny towns which had awful cinema halls. So my first memory of a Dharmendra film is actually of Aankhen – which I loved so much, I wanted to see every Dharmendra film with Mala Sinha after that! (Sadly, none of them matched up to the sheer campy brilliance of Aankhen). My favourite is of course the one from Anupama, the rest of your list is also what would feature in my list of favourites. I absolutely love six of those ten from your list (1,3,4,5,6,10) and I also like what Sucheta mentioned “Jane kya dhoondti rehti hain” but the one I absolutely love and that is missing from this list is “Na ja kahin ab na ja dil ke sivay” from Mere humdam mere dost (same movie which had “Hui sham unka”). Perhaps more of a showcase of Rafi’s abundant talent, in this song he scales full range of octaves riding along on a combination of Hindustani and Western instruments. In contrast to Hui Sham, Laxmi Pyare created a blissful romantic number with the title song of this movie. The other song “Jane Kya Dhoondti Rehti Hain..” is perhaps known more for the haunting lyrics (Kaifi Azmi) and depressing tone in general, though very beautiful music by Khaiyyam.. Yes, I do love Na jaa kahin ab na jaa – it’s a wonderfully romantic song. As I mentioned in my post, I’d been dithering between that and Hui shaam unka khayaal aa gaya, but then settled for the latter. As it was, my post was seeming to be too full of romantic songs! Not that I have a problem with that, but still. It’s a lovely song, and well-picturised, too, I think. And Jaane kya dhoondti rehti hain is good, too. The Naya Zamana of 1971, music by SD and sung beautifully by Kishore had the dream team of Dharam-Hema, both with stunning looks and style. It had some really beautiful numbers composed by crafty Burman da..
Those two are indeed Dharam signature songs (for color movies at least). Don’t know if you plan to do Dharmendra duets some day. If you do, there would be few songs that are tough to ignore including a personal favorite that you mentioned earlier from Izzat (1968) – Yeh Dil Tum Bin Kahin Lagta Nahi. Digression should be my middle name..
Wow! Never heard that peppy song before. Thanks for sharing. I also agree with you about Dharamendra being much more likable prior to his typical Garam-Dharam movies in the later part of his career. Just like Dev sahab, whom I adored in black and white movies. He wasn’t the same for me in color movies and almost unbearable in later movies. And I don’t think it has to do with aging; both Dev and Rajesh lost all the charm, for me, due to their newly adapted idiosyncrasies .. Boy! I really have to stop doing these detours..
Ah, you and I are kindred souls. :-) I find both Deb Anand and Rajesh Khanna insufferable in their later films because of those mannerisms both of them adopted. Frankly, i put Manoj Kumar in the same bracket – I used to like him a lot in his early films (like Shaadi, Naqli Nawab and Woh Kaun Thi), or even extending into Gumnaam – but his patriotic avatar and that holier-than-thou air which pervades films like Purab aur Pachhim irritate the hell out of me. Manoj Kumar was manageable without his obsession for his side profile (and those mannerisms of course). My favorite is his Patthar ke sanam (you listed on mail piano songs). He wasn’t too too bad until his association with patriotic singer Mahendra Kapoor came about. That was the last straw for me. Couldn’t handle the deadly duo determined to kill every patriotic feeling I may have left in me.. :) Sorry, enough bashing those poor guys. Nothing against patriotic songs either.. Yes! In fact, while I was researching this post, I once again watched one of my favourite Dharmendra club songs – Main tera tu meri duniya jale toh jale, from Pyaar Hi Pyaar, and I think you were there. The Monkees were, at any rate. Yes, the songs from Jheel ke Us Paar were nice, though it wouldn’t have fitted my pre-70s cut-off date. As for Chandan ka Palna, I have to admit my mind tends to blank out that film, including its songs. It was one of the ghastliest, most regressive films I’ve ever seen, so perhaps that’s why I even forget what songs it had. And now I am going to listen to them. That!s my entertainment here in the hospital. Thank you, Lalitha! I’m so glad you liked the songs (and I hope your sister’s recovering well). Interesting post as Dharmendra isn’t someone you instantly associate with great songs & picturisations….Rajesh Khanna will always have the monopoly there. Even the beautifully haunting Tum Pukar Lo from Khamoshi I associate with Rajesh Khanna! My fav Dharmendra song would be ‘Koi Haseena’ from Sholay plus love the Sparks between him & Hema as it highlights what Dharmendra does best. That’s rather subjective, I think. While I like Rajesh Khanna in some song picturisations, I can’t bear him in others. And there are several male stars who I think, in their heyday, appeared in some gloriously romantic songs. Shammi Kapoor for one, Shashi Kapoor for another. Dev Anand. And Dharmendra. This song was in his earlier movie, “Purnima” – the wording were good and his acting was good too then! Thank you for adding that! I like Tumhe zindagi ke ujaale mubaarak, though I haven’t watched Purnima. Beautiful song. Great post Madhu, and a list of lovely songs….Tum pukar lo and Ya dil ki suno are two of my all time favorites as well. I also like Main kahin kavi na banjaon from Pyar hi Pyar and Yakeen karlo from Yakeen. Thank you! I also like Main kaheen kavi na ban jaaoon, though Dekha hai teri aankhon mein appeals to me just that little bit more. I had forgotten about Yakeen kar lo – thanks for reminding me of it! I was remembering Kinara the other day, because I was watching another Hema Malini-starrer, Gulzar film (Palon ki Chhaon Mein). This is a lovely song. Thanks. and hum bewafa from shaalimaar…complete with the hurr hurr ! but a nice song nonetheless..
there seems to be Rafi and then Kishore phases in Dharamendra’s life ! Yum. Yes, he did look very good in Raja Jani. I must rewatch that film – I remember enjoying it quite a bit! this is an old favourite.. for many reasons.. Gaadi bula rahi hai from dost ! kishore for dharamendra again..
Talking of Dharmendra-Kishore Kumar songs, one which I used to like very much as a child was Kisi shaayar ki ghazal, dream girl. Oh, yes, Gaadi bula rahi hai is a good song. I’ve never got around to watching the film, though. ah well.. i was waiting that somebody will mention this song, but no body has..so here it is ..main jat yamla pagla from Pratigya..so Mohd. Rafi for a later day Dharmendra ..the garam-dharam-potoiler avtaar. Dharamendra has a great comic timing which was well used in Chupke Chupke and Sholay. Unfortunately rest of the time it had to be reduced to slap stick. That said, Pratigya was a bit better than others of its ilk. Anyhow this song can be watched simply for the joie-de-vivre and gay abandon of Dhramendra, especially the last stanza. It must not be easy to do this in front of a camera.. I have somehow never got around to watching Pratigya, though of course I’ve heard Main jatt yamla pagla deewaana. Quite a signature song, actually, for the Dharmendra of that period (not surprising, then, that he used the words for the movie he made a few years ago along with Sunny Deol and Bobby Deol). When I became a Dharmendra fan some years ago, I started out watching his films from the 70s, and your posts played an important role in introducing me to his most memorable performances from the 60s. Thank you so much for that, and for this post. I love all your choices. DG, I had hoped you would come by this post! :-) I’m glad you liked the songs. After I’d posted this, I was inspired to rewatch Blackmail. It’s one of my favourite Dharmendra movies from the 70s, and was so satisfying, all over again. Ahh… Blackmail! I should rewatch that soon too! So enjoyable. 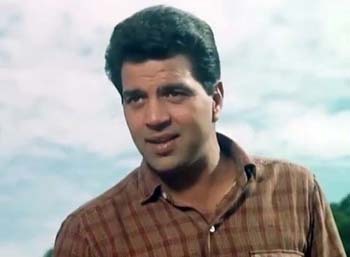 The title of the post is my favourite Dharmendra songs – I’m not calling them the best songs. And – I don’t know if you’ve ever heard of this – but there’s an idiom about beauty lying in the eye of the beholder. It means the appreciation of anything is subjective. It seems to me the two of us have diametrically opposite ideas of what constitutes ‘good’ and ‘bad’, because, to be honest, I think your suggestions are pretty forgettable. Thank you! I’m so glad you enjoyed this post. Yes, there’s something about the way Dharmendra looks at a beloved that makes you think he is actually in love with the woman, not acting! I do like him paired with Sharmila Tagore the best. They’re really brilliant in everything from Anupama to Chupke-Chupke, even though I don’t particularly care for the film itself in a couple of cases (most notably Mere Humdum Mere Dost. I also like him with Asha Parekh. Thank you for taking the time to comment! I must watch Yeh dil deewaana hai to see his expression. Hadn’t noticed it. One of my ATF from Chandan Ka Palna: https://www.youtube.com/watch?v=7z3yCY6zvSI. Marvelous composition of RDB and sung beautifully by Rafi as usual…I wish RDB had composed more such songs with Rafi. Yes, Tumhe dekha hai maine is a beautiful song. I keep forgetting the songs of this film because the film was so bad – I think my mind blank it out! I would have liked to see ‘ Mehbooba Teri Tasveer….’ from Ishq Par Zor Nahin right at the very top. 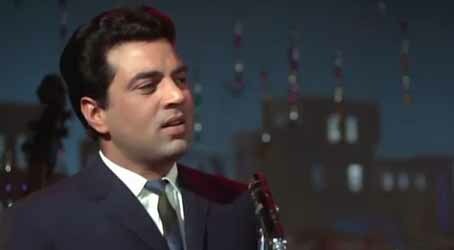 Nice song, but – as I mentioned in the title of the post – these are ten of my favourite Dharmendra songs. And that isn’t one of my favourites of his.